Over the past year, we've seen a lot to get excited about over this tiny computer, the Raspberry Pi. It can stream video via Airplay, can run Quake III, yet only costs $35. Fortunately, now you can buy it. The Model B Raspberry Pi is just finishing production in China, but is now available for pre-order. It features an ARM11 processor, 256MB of RAM, 2 USB ports, a LAN port, an SD card slot, audio-out and HDMI-out. It's capable of running an Ubuntu install or a version of Xbox Media Center, but nothing comes per-installed so you'll be spending some time at a command line. But the best bit is: it costs $35. Thirty. Five. Freakin'. Dollars. This thing is incredibly cheap, and a great way to get you—or your kids—into coding. In fact, the beauty of the Raspberry Pi business model is that all the profits will be pushed into a charity set up to encourage kids to get into coding, an initiative which will itself use these tiny computers. 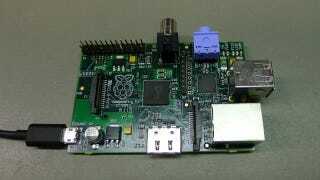 You can buy Raspberry Pi online from Premier Farnell or RS Components. Update: Demand is proving high, and the Farnell and RS websites are struggling to deal with the demand. Patience, young grasshopper.